We, the thirteen exchange students from different countries, went to ski. It was a long drive. We went to Alexandria. In the car we talked about our homes. We also sang songs and danced. We had fun in the car even though it was a long drive. 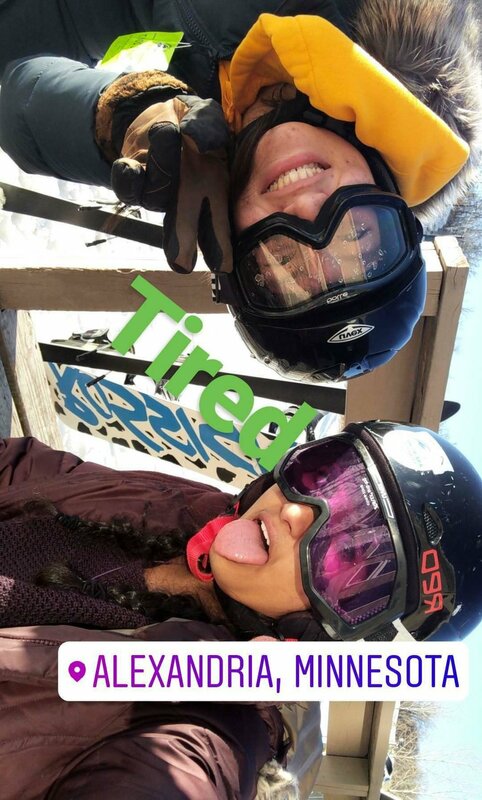 We went to ski and it was my first time. We went to ski and it was super fun. It was not cold. We all were super excited. I fell down a lot but I had fun, even though it was scary in the beginning. In the evening we all sang songs and played games. We got ready for the country fair. 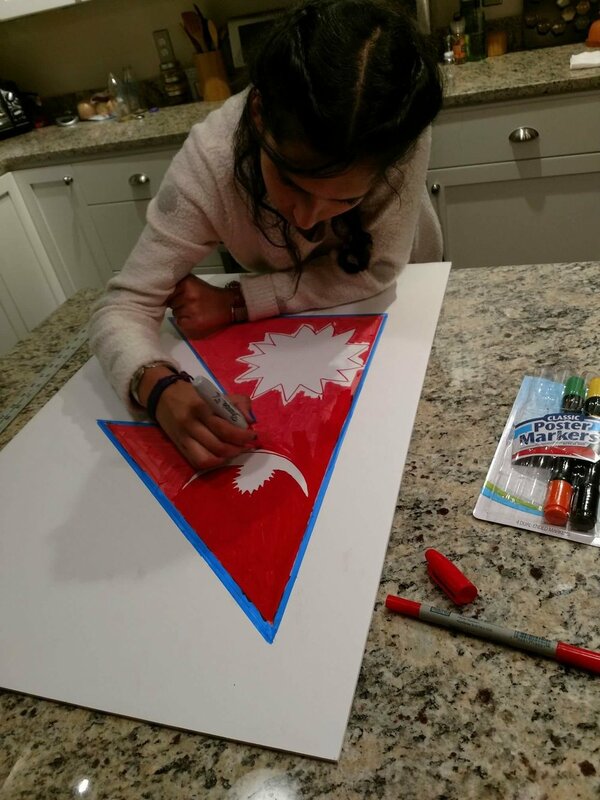 We drew the Nepali flag and printed some pictures of Nepal. In the morning my host mom and I went to Paco's home and Sam was also there. I went with Paco and Sam to the country fair but Sam was feeling sleepy in the car so I took a lot of his pictures. Then we went to the fair and I met all of the other exchange students. We hugged each other and then we started doing stuff. Then people started coming to the fair. We talked about our country and then all of us exchange students exchanged our pins. We had our lunch, it was so nice to be all together again. We asians were only in our traditional dresses and wearing nationals dress is always fun and makes us feel proud. We took pictures and had a lot of fun. Paco, Sam, and I left early. I got back home and the funny thing was that I didn’t have a key so I called my host mom who was at her niece’s children's birthday party. She came home and went back. I took a shower and rested. We had competitions in cooking class. My friends and I made burgers. It was fun to make but we were really nervous. We had judges and it was working nicely. We thought we would run out of time but we did it! We went to our neighbours party. There was a cute cat and a big tree. I met lot of new people. There were good decorations and we took a picture. I talked about my home, where I’m from, and where I live. It was fun sharing with a lot of new people. My host mom took me to nail images. I had fake nails and it was my first time and my host mom had French nail polish. I had Christmas colors so my nails were festive with red and silver. I loved it very much. In the evening, my host mom, my friend Alexia and I went to Arboretum which was really awesome. 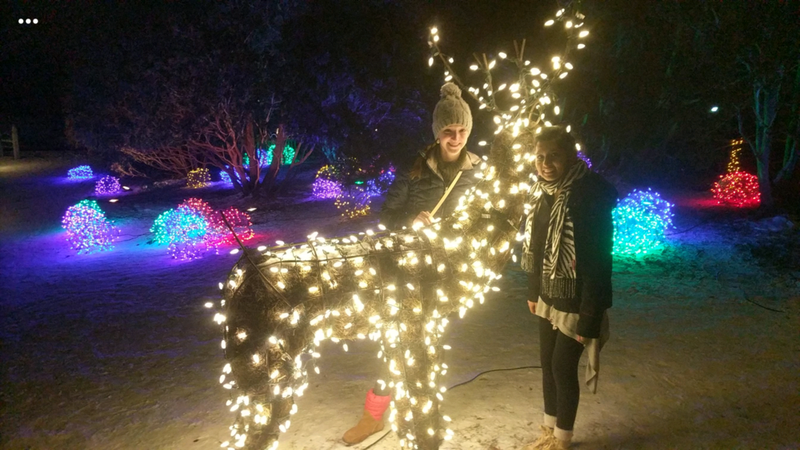 There were lots of colors of lights … we took pictures and had fun. In the morning we went to the Rotary Christmas party. There were friends from Edina there too. They were singing carols and I had so much fun. I took chex mix and everyone bought something as it was the last day of school before break. So in my first hour class, English, we played games and had cookies and had fun. 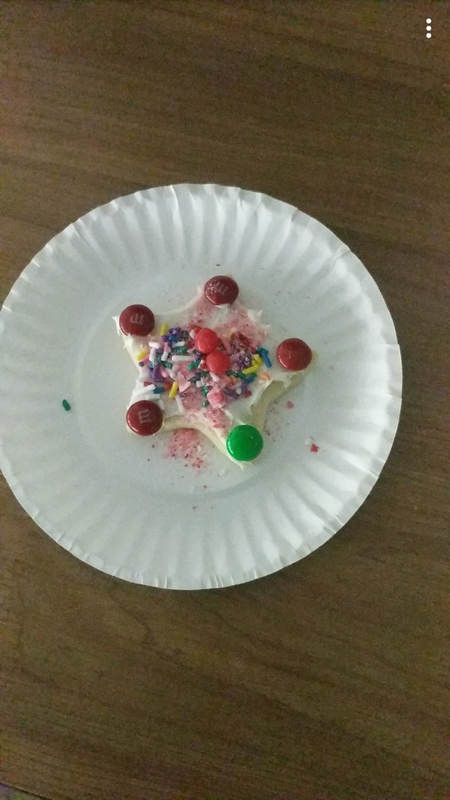 In cooking class we made cookies for Christmas. In the morning I went with Paula to her house to celebrate Schwatrz party. She invited me to her party and I went to her house. In the evening, we got ready and Angela did my makeup which was so good. We went to Paula’s family’s house and then I met a lot of children who were super funny and I love them so much. They were like my brothers and sisters back home. We played games and had our dinner. We talked a lot. Us children were down in the basement playing games while the rest of the families were talking. We took pictures, played games, and had lots of fun. I stayed with Paula that night. On the next day, Christmas Eve, I went with Paula and her family to church. Everything was very American Christmas and I was super excited. The carols were so nice. It was a nice time in church. After I was done with church I came back home and then my host mom and I went to her mom’s home. I took gifts for her when we went. 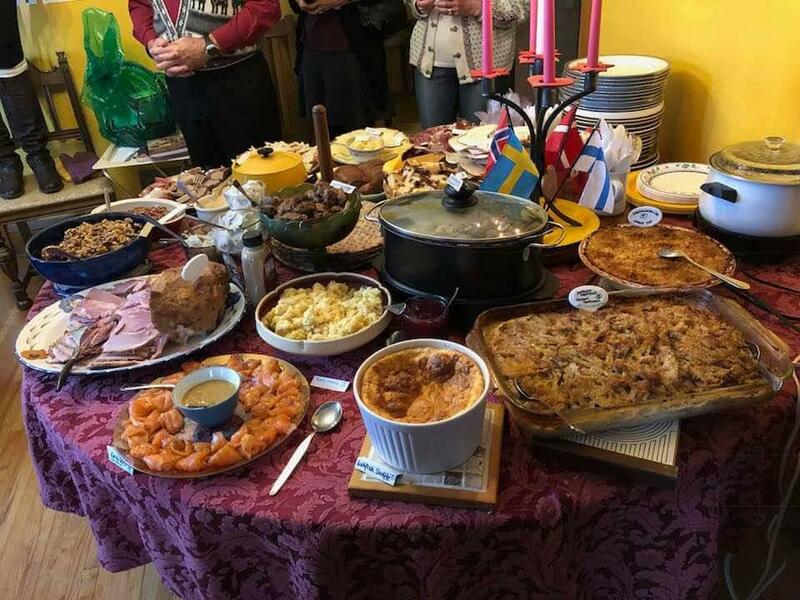 There were six people for dinner. I kept all of the gifts under the tree. We had our dinner and then we exchanged our gifts. We told jokes and then went to evening church. I went to church two times which was super super fun and a new experience. Both church’s had their own ways and it was fun seeing. Then we came back home. I had a super fun Christmas eve. In the morning my host mom and I made fried rice. We packed all our gifts. My host mom and I got ready to go to her brother’s house to celebrate Christmas. There were like 26 people and children too. My host mom introduced me to everyone. There was a lot of new food. We had our food and then we opened our presents. My host mom, her sister, her son, and I went to Eden Borough Park. It was funny cause it was only for children below 14 years and I was too big for that, but I played hide and seek with children. It was fun. After we got home we watched Pitch Perfect 1 because we were going to watch Pitch Perfect 3. So in the evening we went to watch a movie called Pitch Perfect 3. It was a really nice movie and funny too. My favourite actress was Fat Amy. My host mom and I went to buy stuff for Chatpate. We went to four shops. At noonish we went to watch a hockey game which was my first time. I had never seen a hockey game before. I had fun watching it. We were rooting for the Wilds and the Wilds won the game by 4-2. I had a great time. I was home alone so Cheis took me for out for thai food for lunch and it was really good. We had egg rolls and thai fried rice. Chris’ husband, John, and I went to have lunch in a thai and Chinese restaurant. Then he said that it was going to be cold and he took me to get warm clothes. I got warm pants and a warm sweater which was really nice of him, I love those so much. In the morning, Chris had a doctor’s appointment so she couldn’t join us for lunch but we decided to go to a movie, but because of the New Year every ticket was already sold. So we couldn’t go see the movie. I came back home. 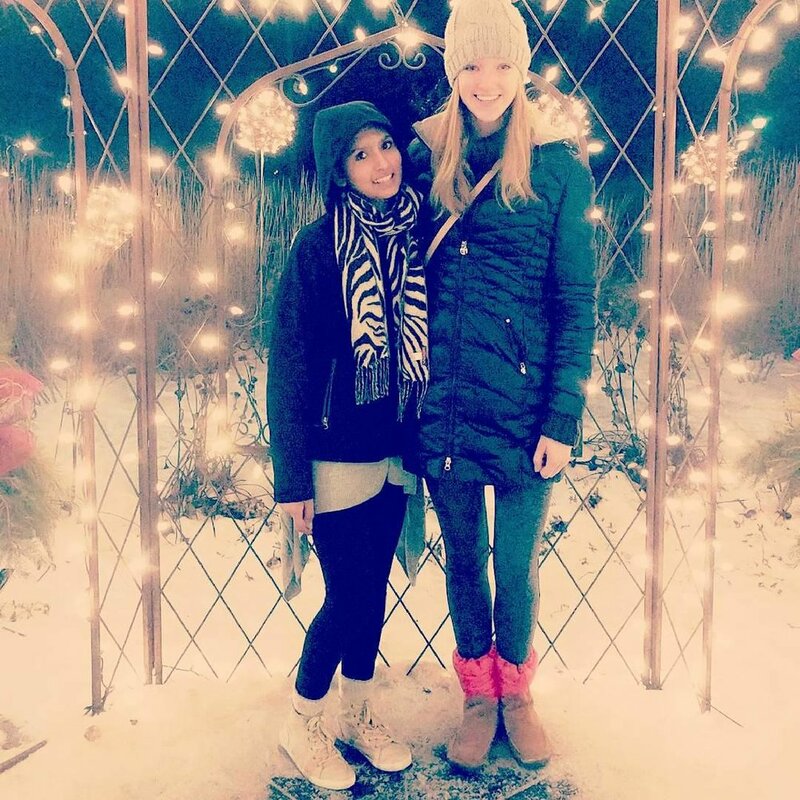 I talked to my friend Nado who is also an exchange student from Indonesia about meeting so we decided to meet in Buck Hill. Although my friend and I decided to meet in Buck Hill, due to cold weather we couldn’t ski. So we decided to meet in Mall of America and my host mom took me there. Nado was there and then we played games and our host parents talked. We went on the scary ride where you go up and then you come down very fast. I thought my head would come out of my body when coming down from the very high ride. Nado and I screamed a lot. In the next ride, Nado and I were with two little kids and they were so calm and having fun. Nado and I looked at each other and we laughed and then we asked them if they were scared or not, but they said no they were not. Then at last we went to play boating games which was scary too. Nado and I were the only ones there and I was in the front and I said to Nado that we were about to go all the way down like the last ride. She was screaming from the beginning. They were super funny and scary games. then we went to have lunch and had sushi. I love sushi. Then I came with Nado to her home. There was one dog and five cats. I told them that back home we have four dogs. For dinner we had a pizza party and we played games which was super fun, then we said we wanted to watch a horror movie. Everyone agreed but Nado said no. We didn’t watch a horror movie and instead watched a true story of a girl who was blind and mute. The movie was called Hush. Some parts were scary and Nado screamed a lot. Everyone was scared because of her screaming and she was right next to me. It was scary sitting with her and hearing her screaming. Nado, her host dad, and I went sledding. It was my first time. I had fun. I came back home with Nado. After a few hours Alisa was also there. We all decided to spend time together for New Years so we played games and had a lot of fun. We had a pizza party. We went bowling but it was too packed so we came back home and played new games and had fun. We watched a movie. Our New Year’s Eve was fun. In the morning, Nado, her host mom, and I went for bowling. We had a lot of fun. We came for Alisa because she was alone home and she didn’t go with us for bowling. Then Alisa’s counselor came to pick her up. Nado, her host mom, and I went to Nado’s home in Owatonna. We played games and had fun with Nado’s host parents. We came back home in the evening. At noon I went sledding with my friends. Then we went to have lunch in Alexia’s home. We had fun there. I taught them Nepali and it was the most fun part of my day. 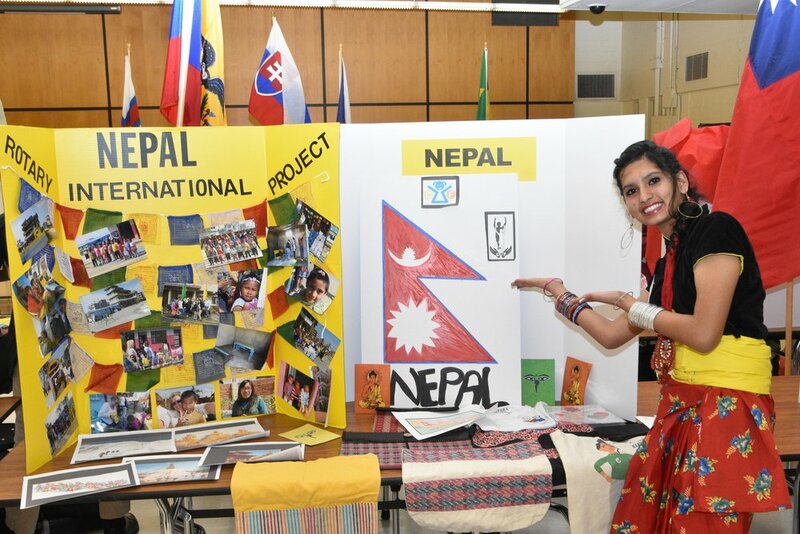 We talked about Nepal. At noon, my host mom and I went to watch a movie called Molly’s game. It was such a good movie. I love it so much. In the evening my host mom and I made chatpate. It was really good and we had fun making it. Chris took me to a Tibetan restaurant for lunch and we went to Mall of America for sea life. We took a picture and saw a lot of fishes. They were all so cool. For dinner we went to a Chinese restaurant. We went to have dinner with my third host parents because they wanted to meet me. I talked to my third host parents and had fun. Paula took me to Starbucks where we had coffee and hot chocolate and spent some time. I always have fun spending time with her and everyone. After that Paula dropped me at my third host family’s house. They have a dog named Molly. She was really cute and the funny thing was that when Molly is too excited to see new people she will just poo. We went to play mini golf and it was my first time, we had so much fun. The funny thing was that it was my first and last round I shot a hole in one and then I won the free round playing card. Haha that was funny. Then we went to have lunch in Eden Prairie. I tried something new called soba noodles which is a Japanese name for buckwheat. It was really good. New for me but I liked it. We went back home and as Molly say, she was so excited that we were home and she went poo right there. It was so funny that we all laughed so hard. We played a game called Yahtzee which was super fun. I had a fun day with my third host family.